Once again [the Jews] tried to arrest [Jesus], but he got away and left them. He went beyond the Jordan River near the place where John was first baptizing and stayed there awhile. And many followed him. "John didn't perform miraculous signs," they remarked to one another, "but everything he said about this man has come true." And many who were there believed in Jesus. Isn't it amazing the power a godly legacy has on the hearts of those who loved the one who left them the legacy? 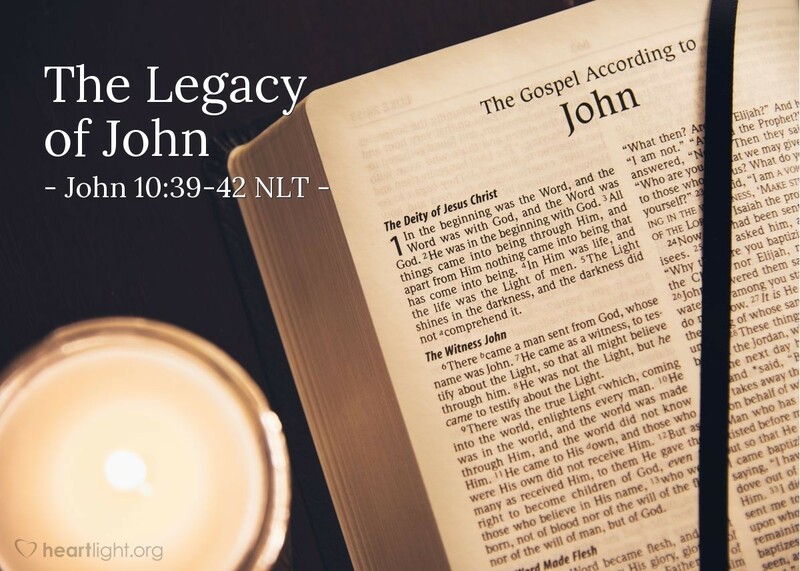 John the Baptizer is dead, but his teaching is very much alive. He told great things about Jesus. He helped prepare the way for the Messiah, his cousin from Nazareth. Even though Herod had John killed, his voice and influence weren't stilled. While none of us will probably ever be a John the Baptizer to a host of people, we all can be like John to the folks we encounter. We can be people of character who help them find Jesus. That's a legacy that can live for generations and make an eternal difference in the lives that follow us! Father, glorious God of the ages, please use me to lead others to Jesus. Help me make a difference in the lives of those around me. Use me to be a John the Baptizer to those in my influence. In Jesus' name. Amen.